Albany – Alice Olivia Bethea, 103, went home to our Lord, on Monday, September 3, 2018. A wake will be held on Tuesday, September 11, 2018 at the Church of Jesus Christ, Clinton Ave., Albany, from 6:00 pm to 9:00 pm. A viewing will be held on Wednesday, September 12, 2018 at Greater St. John’s COGIC, 74 4th Ave, Albany from 9:00 am to 10:00 am., followed by a Funeral Service at 10:00 am. Interment will follow the service at Graceland Cemetery. Add your memories to the guest book of Alice Bethea. One of my favorite memories is from 2015 when we were out to eat and Mother Bethea got up and walked around and let people know that she was 100. 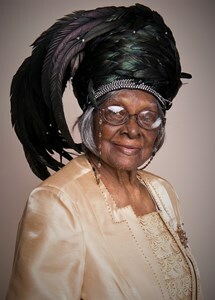 She told them that Lord had heard her prayer and let her make it to 100! She was so happy, she pulled out a photo of her fishing at 100! What an amazing women, church mother and Christ believer. Praise the Lord: My deepest sympathy to the family and church family. The late Bishop Stanley Halton shared something with me regarding Mother Bethea. At a time before they were Bishops, Bishop Halton was driving in Detroit, MI, the late Bishop Rube Bethea and Mother Bethea was in the car with him. Mother Bethea had told Bishop halton he was driving too fast, but Bishop Halton kept driving. Shortly after, Bishop Halton was stopped by the police. Mother Bethea, in the back seat, was hitting Bishop Halton with a scarf, telling him "I told you that you were driving too fast" when the police officer got to the car. Bishop Halton recounted, when the officer saw and heard Mother Bethea he told Bishop Halton he was free to go because Mother Bethea had taken care of him. I still laugh thinking of that. Mother Bethea was such a wonderful woman of God. I celebrate her life of 103 years with all of you. You are in my prayers.